MERCATOR - Peregrinatio Israelitaru In Deserto. MERCATOR, G. / HONDIUS, J. - Peregrinatio Israelitaru In Deserto. Peregrinatio Israelitaru In Deserto. - MERCATOR, G. / HONDIUS, J. Title : Peregrinatio Israelitaru In Deserto.. Size : 5.8 x 7.4 inches. / 14.8 x 18.8 cm. Description :A nice small map depicting the Exodus and the wandering of the Children of Israel. Inset of the encampment enclosed in a strapwork border. 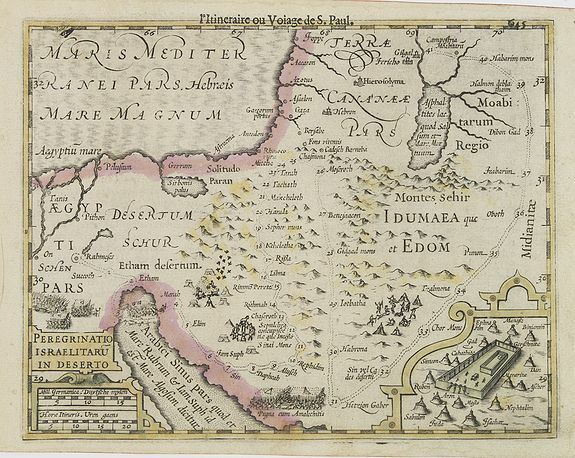 From the first French-text edition of Jodocus Hondius' Atlas Minor. Condition : Some age toning of the paper. Faint water stain along lower margin just affecting part of scale border. Else good.